After a brief blip upwards right at the open in Sydney, gold commenced a steady, slow upward trend throughout most of the day. After Sydney closed, it dropped a wee bit and then began an asymptotic moon shot that was immediately capped upon the London open. During the entire London trading day, gold virtually flatlined as if someone had pulled the plug on its EKG, but as soon as London’s trading desks closed and New was on its own, the Hong Kong pattern began to re-establish itself - only to be capped again toward the end of the session. All of that occurred at a time when the charts looked rather toppy for gold and would ordinarily invite expectations of some consolidation in the days to come. News-wise, there were very few reasons given for this two-stage mini blow-off that would withstand scrutiny. 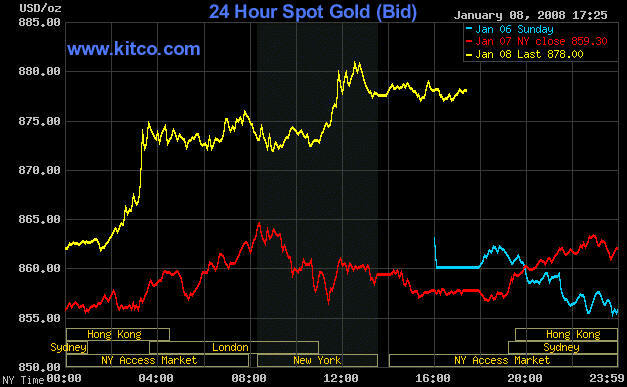 Oil and commodity price rises reportedly occurred “on the back of” rising gold, so they could not be the reason. In any case, the price of oil only “inched” higher in Asian trading. There were no big jumps, and oil didn’t even recover what it lost on Monday. The Iranian attack boat “crisis” can’t be the reason, either. I wasn’t there. I don’t know whether the US ships were really threatened or not, or whether they possibly strayed into Iranian waters to provoke the attack - a day before the crucial New Hampshire primary vote, just so people wouldn’t get any ideas of voting for someone who does not want to continue our military occupation of the middle east. All I know is that the ‘attack’ occurred well before Monday, and yesterday the gold price hardly budged and even ended down, so don’t tell me that was the reason. Let’s see. What else could have caused this? What’s more, what could have caused the price to go flat during the precise hours of the London trading day and at the end of New York trading? Maybe traders and investors worldwide are just smarter than we are allowed to give them credit for. Maybe they know ‘the jig is up’ or will be up soon, so they temporarily overwhelmed the defenses of the gold price controllers? Not that I’m complaining. The controllers are doing a fantastic job keeping the raging bull in check so it doesn’t all just fizzle out in a huge blow-off top like it did in 1980. That way, the gold bull is likely to be preserved for many years, even decades to come. Thanks, guys! Naturally, it’s not just all niceness and altruism on their part, however. They benefit by being able to get rid of any remaining short plays. The good part about those is that there aren’t that many in play any more, and under current conditions, central banks will be hard pressed to find too many takers when it comes to gold leasing. Who wants to short the gold market in an environment like the one we live in, with gold about to hit $900 and no let-up in sight? Maybe in late spring early summer they’ll have a chance again - but that window is getting smaller and smaller. Quite possibly, the market is sensing the Fed’s desperately uncomfortable position between the proverbial rock and a hard place: Cut, and they doom the dollar, hike and they doom the economy. Just in time to relieve the Fed from that dilemma, however, the Bushmeister announced a possible tax stimulus coming down the pike. That seemed to help the dollar quite a bit on Wednesday..
At least something positive comes out of this mess. Lower taxes are always good for the economy. If only they realized that doing away with income taxes entirely and booting the Fed off its perch on top of that would be an even better treatment plan. Well, it may be that the controllers’ tactics finally put them in such a bind that dramatic tax cuts turn out to be the only effective policy tool remaining on their hands. In that case, however, who is going to pay the Fed its hard-earned interest on the national debt? Tsk, tsk. Poor Fed. It can’t lower and it can’t hike. It now has to rely on its vassal, the US government, to keep the economy going - and soon that vassal may realize that it can do far better without its overlord. What will happen now if the government needs more money to fight more wars? On the one hand, with the it’s hands tied, the Fed can no longer just loan the money into existence because that will be inflationary and thereby the equivalent of cutting rates. On the other hand, when tax cuts are the last policy resort the government can’t squeeze the money out of the people anymore. Can the US government borrow from China, then? Yes, but only to the extent of US imports from China. China will only buy treasuries with dollars it earns, but China itself has inflation problems and so must let its currency rise faster against the dollar and other currencies. Therefore, with Chinese goods getting more expensive (even as they get more toxic and defective, thereby reducing demand) and with the US economy slowing down, demand for imports will shrink, so China won’t earn as many dollars to loan back to our government by buying treasuries. What if our poor government sees itself forced to both occupy Pakistan and bomb Iran - or maybe only one or the other? Where will it get the money? Will China (and possibly India) replace the Federal Reserve as our lender(s) of last resort? If so, these two countries will gain an extraordinary level of influence over US policy, don’t you think? It would be a good thing for anyone to own some gold in such times. Quite possibly the world’s traders and investors, both large and small, were sniffing the wind yesterday and sensed something like this coming. Maybe that’s why gold jumped so fast in a week during which neither the charts nor the news are indicating that much pressure under the price of gold. Maybe it would be good for you to get some, too.